These are some really fine hacks. 1. Get acquainted with different knives, types of cuts, and how to care for your blades. 2. Curl your fingers when chopping to protect them from injury. You're less likely to cut your fingers. 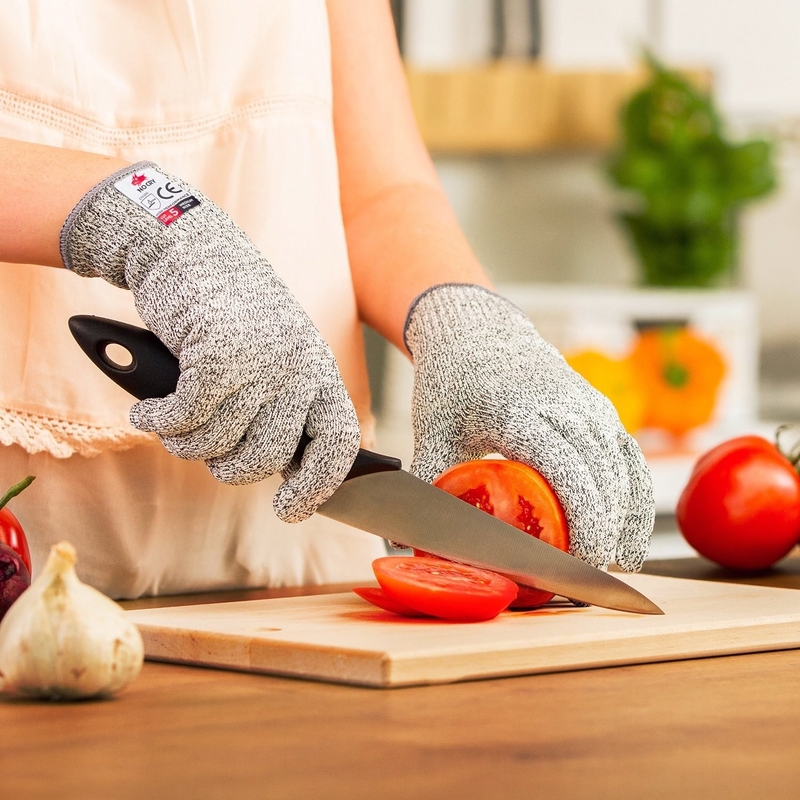 If you're still worried, you can buy a pair of cut-resistant gloves for $12. 3. Slice with single strokes from front to back, holding the knife as vertical as possible. 4. For inspiration, just watch these Japanese cutting techniques. Of course, in order to chop so quickly and so delicately, you need a high-quality knife. For starters, you can get a pricier one for $50 or a cheaper one for $20. Both are excellent knives, with a slight difference in weight and sharpness. If you want to learn more Japanese cutting techniques (how they achieve such beautifully thin slices), try mastering these types of cuts. 5. Serrated blades work better for some produce, like tomatoes. Get one from Amazon for $35. 6. 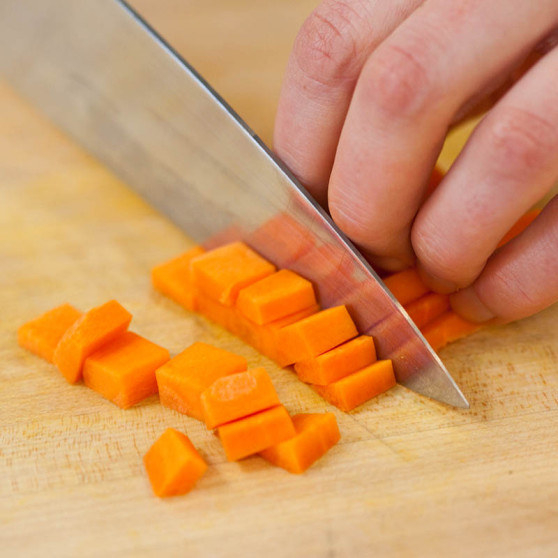 Keep just the tip of the blade on the cutting board while chopping, and be sure to lift between cuts. This helps you cut more efficiently and also keeps your vegetables from rolling all over the place. 7. Dice onions by slicing them lengthwise before chopping them up. 8. Conquer your fear of cutting pineapples. 9. Peel a pomegranate easily by hitting the sides with a spoon after submerging the fruit in water. 10. Make checkerboard slits to produce pretty mango chunks. 11. Cut butternut squash into small boats before slicing them into crescent moons. 12. Scoop out the seeds in jalapeños before you slice. 13. Remove the core of a head of iceberg lettuce in seconds by slamming it down on a hard surface. 14. Prep the perfect roasted artichoke by chopping off the ends and trimming the sides. 15. Roast some delicious cauliflower by chopping it into florets. 16. Stop squirting juice in your eyes from eating it with a spoon by learning how to segment your grapefruit. 17. Neatly dice your bell peppers by slicing out their centers first. 18. Use all parts of the broccoli by chopping up the stem and the head. 19. Cut leeks into ringlets or thin slivers. 20. Chop up the bulbs after removing the cores to make tiny arcs of fennel. 21. If you don't want to eat the insides with a spoon, learn how to properly slay a dragon fruit. And that's it! Now you're a master chef!